The U.S. Annual Climate Normals for 1981 to 2010 are 30-year averages of meteorological parameters for thousands of U.S. stations located across the 50 states, as well as U.S. territories, commonwealths, the Compact of Free Association nations, and one station in Canada. NOAA Climate Normals are a large suite of data products that provide users with many tools to understand typical climate conditions for thousands of locations across the United States. As many NWS stations as possible are used, including those from the NWS Cooperative Observer Program (COOP) Network as well as some additional stations that have a Weather Bureau Army-Navy (WBAN) station identification number, including stations from the Climate Reference Network (CRN). The comprehensive U.S. Climate Normals dataset includes various derived products including daily air temperature normals (including maximum and minimum temperature normal, heating and cooling degree day normal, and others), precipitation normals (including snowfall and snow depth, percentiles, frequencies and other), and hourly normals (all normal derived from hourly data including temperature, dew point, heat index, wind chill, wind, cloudiness, heating and cooling degree hours, pressure normals). In addition to the standard set of normals, users also can find "agricultural normals", which are used in many industries including but not limited to construction, architecture, pest control, etc. These supplemental "agricultural normals" include frost-freeze date probabilities, growing degree day normals, probabilities of reaching minimum temperature thresholds, and growing season length normals. Users can access the data either by product or by station. Included in the dataset is extensive documentation to describe station metadata, filename descriptions, and methodology of producing the data. All data utilized in the computation of the 1981-2010 Climate Normals were taken from the ISD Lite (a subset of derived Integrated Surface Data), the Global Historical Climatology Network-Daily dataset, and standardized monthly temperature data (COOP). These source datasets (including intermediate datasets used in the computation of products) are also archived at the NOAA NCDC. Cite as: Anthony Arguez, Imke Durre, Scott Applequist, Mike Squires, Russell Vose, Xungang Yin, and Rocky Bilotta (2010). NOAA's U.S. 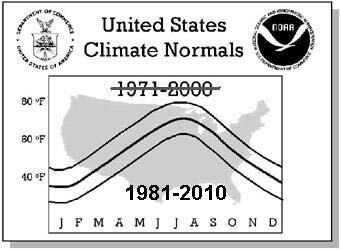 Climate Normals (1981-2010). [indicate subset used]. NOAA National Centers for Environmental Information. DOI:TBD [access date]. Dataset files available for access via HTTP interface. Supplemental Normals are computed to meet specialized user needs, including the agricultural, energy, and construction sectors. README describing the 1981-2010 Supplemental Climate Normals. Status of the 1981-2010 Supplemental Climate Normals. List of stations used in the production of the Air Freezing Index (AFI) dataset, supplement to the 1981-2010 Climate Normals. List of stations used in the production of the Agricultural Normals, supplement to the 1981-2010 Climate Normals. List of stations used in the production of the Growing Degree Days Product Normals, supplement to the 1981-2010 Climate Normals. File naming conventions used in the Agricultural Normals, supplement to the 1981-2010 Climate Normals. List of stations used in the production of the 10-Year Hourly Climate Normals, supplement to the 1981-2010 Climate Normals. File naming conventions used in the 10-Year Hourly Climate Normals, supplement to the 1981-2010 Climate Normals. Purpose Climate Normals are a suite of products that provide users with the means to understand typical climate conditions for thousands of locations across the United States. Lineage Statement Supplemental normals were originally made public October 2012. An expanded set of supplemental normals was released August 2015. Computation of the NOAA Climate Normals is in accordance with the recommendation of the World Meteorological Organization (WMO), of which the United States is a member. While the WMO mandates each member nation to compute 30-year averages of meteorological quantities at least every 30 years (1931 - 1960, 1961 - 1990, 1991 - 2020, etc. ), the WMO recommends a decadal update, in part to incorporate newer weather stations. Further, the NOAA NCDC has a responsibility to fulfill the mandate of Congress "... to establish and record the climatic conditions of the United States." This responsibility stems from a provision of the Organic Act of October 1, 1890, which established the Weather Bureau as a civilian agency (15 U.S.C. 311). For more information on the generation of the 1981-2010 Supplemental Normals, please see associated documentation. 2013-01-02T00:00:00 - 2013-01-02 - Agricultural Supplemental Climate Normals released. This includes growing degree days, probabilities of first and last frost and freeze events, probabilities of occurrence of minimum temperature thresholds, and growing season length probabilities. For more information, please refer to documentation. 2015-08-17T00:00:00 - 2015-08-17 - Two supplemental products were released: the 10-year Hourly Normals and the Air Freezing Index Product. For more information, please refer to documentation.